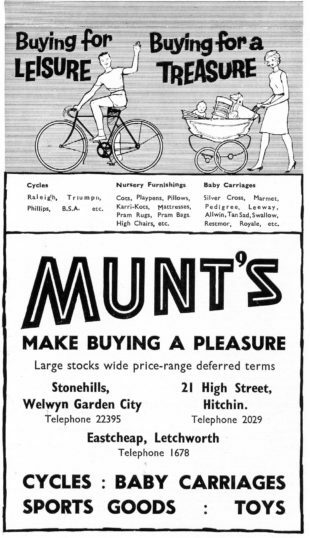 For many junior Welwyn Garden Citizens, Munts was the shop where they got their first bike and the mention of the name brings back happy memories to a generation that knew the Stonehills store well. A cycle store bearing their name had opened in Tinkers Lane (now Lemsford Lane) in 1927 as that area was outside the WGC Company’s control. It proved so successful that the Company invited the fledgling Munt’s to open in new premises, selling bicycles, prams, and toys in a prime location in Stonehills. Munt’s offered a bicycle storage facility around the back of the store and it is said that there could be up 200 cycles at a time stored there at a cost of 2d (1p) each. In 1967 the business transferred to Howardsgate, and on the retirement of the firms directors in 1971 Halfords took it over. I have been connected with Munts for most of my life, as previously mentioned,my dad was manager of the WGC store since 1949, and I have no recollection of them moving to Mill Hill. I also have a brochure from 1935 which records the first 25 years of the firm. I would be willing to let you have a copy if it would be of interest to your organisation,I can be contacted through my e mail address. So glad to see so many people remember the old Munt’s store in Stonehills WGC, it was replaced by the multi storey car park, Munt’s moved to the old Underwood store in Howard’s gate, which was sold to Halford in the early 70’s. Ah yes Munts. Even as a wayward lad in the 50’s I could always rely on Munts for the sale of pellets for my airgun. Happy days eh? Oh, Munts, the memories. Mum paid £26-14-8 for a new bicycle from Munts in early 1947, and I had it for about three years. I remember we had a five year warranty, so when I outgrew it Mum got her money back. My brother, as a kid, was always very fussy and he never liked the bikes at Munts so Dad built him one. To this day I have never known why! Colin never had a Munts bicycle in his life but he did buy other accesories from there too. Oh yes, we all bought bicycles from the Munts shop on Stonehills. 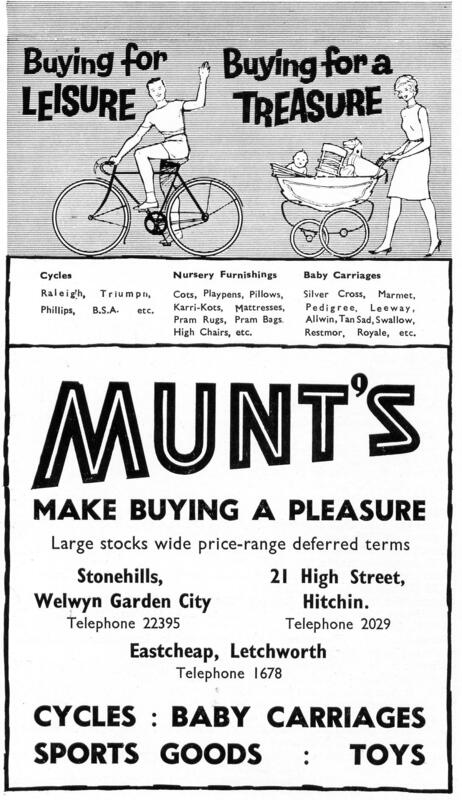 We bought a pram from Munts for the arrival of our daughter in 1957, and our second pram was from a shop elsewhere in the Garden City. As I remember it in the 1st half of the 60’s it was along nissan hut type building. It had a lovely smell that hit you as you entered – pine floorboards, oil , and a strong smell of rubber from the bike tyres.The bikes were so desirable, I think about £20 would buy you a BSA racer.Such character is expunged from modern shops. The caps as I recall cost 1 1/2d–I asked the price once and was told “three h’apence” and didn’t know what that meant! Years later, after the site had been cleared but before the multi storey car park had been built, I was walking past when my eye was caught by the mosaic doorway, still there and looking very sorry for itself in all the the dust. “Heaven”! To a young lad in the late 50’s this was HEAVEN ! First stop after getting off the 330 bus, shop around for “Stink Bombs” and “Caps”, then onto Sat Morning Pictures to “Dispose Of” my recent purchases. Then back in again after the “Flicks” to do some “Serious Shopping”, parts for the bike and a “New Elastic” for my catapult. “Sweet Memories”! I, too, remember the old wooden floor and all the bikes. I clearly remember buying spare ‘caps’ for my Cap Gun! This must have been in the early sixties. Those were the days! I remember the original Munts store, with its mosaic in the doorway with display windows either side, bare plank floors and rows and rows of bikes. The shop was narrow, and seemed to go back forever. Toys were towards the rear of the store, on the walls on hooks or shelves or in glass cases. Larger items, including some bikes, were hung from the rafters. Staff were perhaps too helpful, and didn’t like children messing with the stock as I recall. The new shop on Howardsgate was a very poor replacement.